Please call for details on sales in this fine condominium complex. 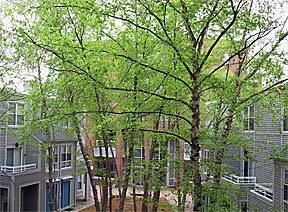 Cambridgeport Commons is a modern, planned community of mid-rise and townhouse units nestled around quiet inner courtyards, yet just three short blocks from the Charles River. All units have central air, in-unit washer/dryers, exceptional closet space, and storage. Wooded courtyards and an underground garage with elevator direct to your floor are among this complex's many fine amenities. A stable and financially sound condominium association, Cambridgeport Commons is professionally managed with an on-site superintendent and grounds crew. The association has completed multiple improvements to the buildings in the past three years. Convenient to Charles River recreation, shopping, and T, shuttle and bus transportation, as well as Harvard, MIT, BU, the Longwood Medical Area, and the Mass. Pike, Cambridgeport Commons is one of Cambridge's most desirable addresses. Please call 617-492-2265 for further information.